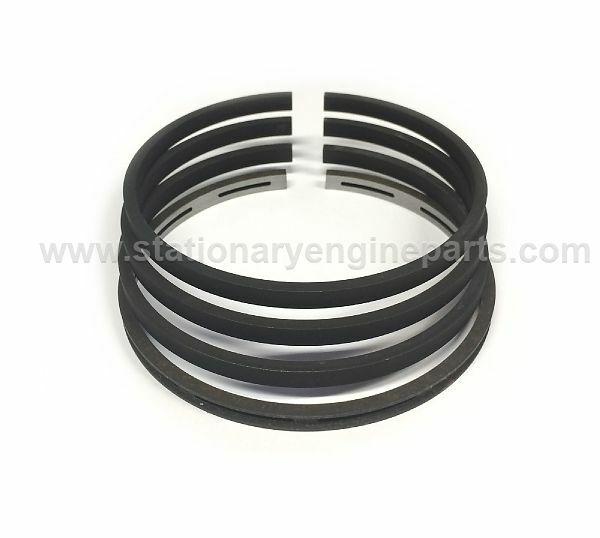 Quality replacement piston ring sets suitable for early Lister A type engines with 3.75" + 0.010" over size diameter cylinder bore's. 3 x 7/32" wide compression rings. 1 x 7/32" wide oil scraper ring. All rings are supplied with radial depths of 0.125" to 0.135"
Thanks to David Edgingtons "Engine Torque" No 218 as published in Kelsey's Stationary Engine Magazine we can confirm that the Lister A type engine received a bore diameter increase from 3.75" to 4" in November 1932 at engine No 222546. Almost from the outset more power was required from the A type engine for driving generator sets, so by April 1927 the first speed increase (to 3hp) had been introduced to specification A56E. As regards to the oil scraper ring, this was added to the 3.75" piston at engine No 48684 (A14) and 48751 (A54), and of course was continued when the 4" bore was introduced. The Lister A & B type oil scraper ring was introduced (according to a note in a build book) initially to curtail oil consumption in the early paraffin engines.